Brunnthal/Munich, Germany, September 27, 2017 – SFC Energy AG (F3C:DE, ISIN: DE0007568578), a leading provider of hybrid power solutions to the stationary and mobile power generation markets, announces the integration of their EFOY Pro fuel cells in the new Vikomobil of Vites GmbH, Ottobrunn, Germany. 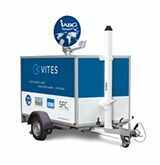 The fuel cells deliver intervention-free off-grid power and long autonomy to the communication systems on the trailer. Vikomobil is a mobile network communication vehicle trailer for government and public safety organizations. In large-scale emergency scenarios or during major events, the system provides integrated solutions for mobile broadband communication between operation site and control center. Vites realized the project with the support of SFC Energy and other cooperation partners. On the trailer, the EFOY Pro fuel cell ensures a reliable power supply to all security and surveillance devices on board, 24/7 and in any weather. The integrated 500 W EFOY Pro 12000 Duo fuel cell, with two 28 l fuel cartridges (M28), is fully automatic, silent, emission-free and almost undetectable in operation. With the fuel cell, Vikomobil is immediately ready for use anywhere, anytime. SFC Energy AG is a leading provider of hybrid solutions to the stationary and portable power generation markets. SFC is the number one supplier of fuel cells, with over 37,000 fuel cells sold to date. The Company has award-winning products and serves a range of applications in the Oil and Gas, Security and Industry, and Consumer markets. The Company is headquartered in Brunnthal/Munich, Germany, operates production facilities in the Netherlands, Romania, and Canada, and sales offices in the U.S and Canada. SFC Energy AG is listed on the Deutsche Boerse Prime Standard (GSIN: 756857 ISIN: DE0007568578).